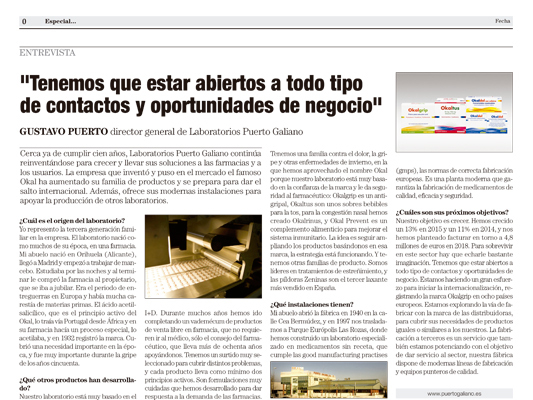 The newspaper “El País” today published the interview conducted last week with the Managing Director of Industrias Farmacéuticas Puerto Galiano, S.A.. It sets out a brief summary of the company’s history, highlighting its future projects, based on 13% growth in 2015 and 11% in 2014, with the aim of achieving a turnover of around 4.8 million euros by 2018. Survival in this sector takes a fair amount of imagination. We need to be open to any type of contact and business opportunity. We are making huge efforts to embark on our internationalisation by registering the Okalgrip brand in eight European countries. We are exploring the option of manufacturing with distributors’ brands, to cover their requirements for products that are the same as or similar to ours. Manufacturing for third parties is another service that we are developing with the aim of serving the sector. Our factory has modern production lines and cutting-edge quality equipment in place.